“Summer is icumen in” is possibly the oldest example of counterpoint in existence. The title might be translated as “Summer has come in”, or “Summer has arrived”. The piece is also known as the Reading rota because the manuscript comes from Reading Abbey, although it may not have been written there. Its composer is anonymous, possibly W. de Wycombe, and it is estimated to date from around 1260. This is a round, that is, a composition in which two or more voices sing exactly the same melody (and may continue repeating it indefinitely), but with each voice beginning at different times so that different parts of the melody coincide in the different voices, but nevertheless fit harmoniously together. The original manuscript includes instructions to play this piece as a six-voice round, with four voices playing the main melody and two voices playing the bass part. This setting is fully developed in our version of the score, starting on page 2. 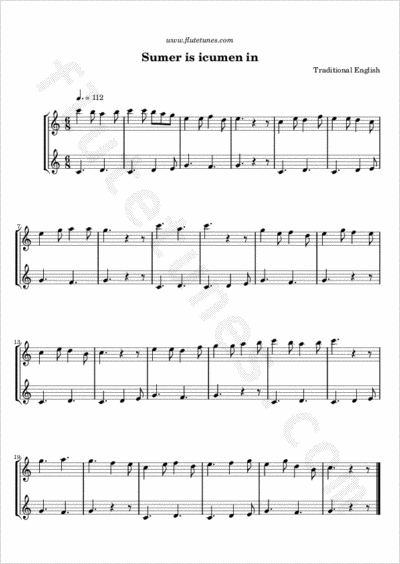 On page 1, instead, you can find the two basic melodies arranged as a duet. You will notice that the bass part actually consists of four measures repeated over and over.